Emeritus Professor Tan Sri Datuk Dr. Augustine S.H. 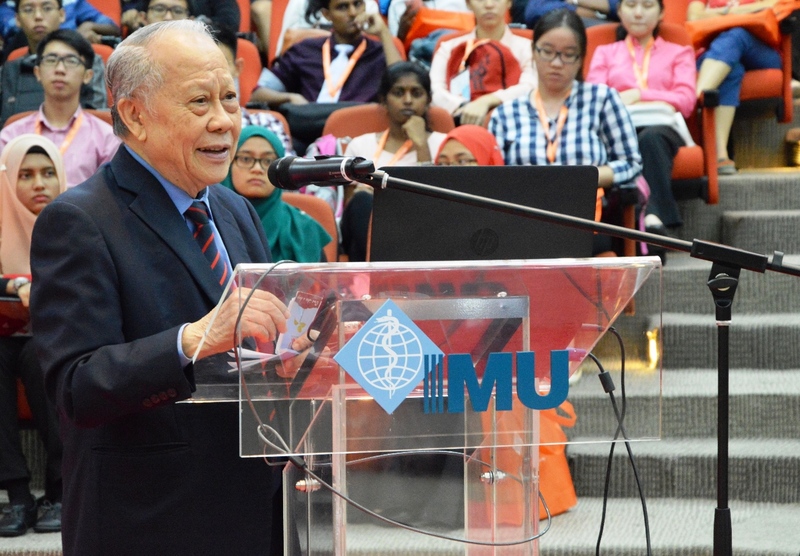 Ong, President of Malaysian Oil Scientists' & Technologists' Association (MOSTA) spoke about his lifetime achievement as a scientist and the importance of chemistry in our daily lives during the ‘Future Direction of Chemistry in Malaysia’ forum. Kuala Lumpur, 30 June 2016 – More than 600 students from various secondary schools and Pre-University programmes around Malaysia took part in the IMU Science Discovery 2016 event recently, organised by International Medical University (IMU) in collaboration with the Malaysian Institute of Chemistry (IKM), Jabatan Kimia Malaysia, Malaysian Palm Oil Board, Pusat Sains Negara, Lembaga Getah Malaysia, Cancer Research Malaysia and Institute for Medical Research (IMR). (Left to right) Dr. Srinivasan, Lecturer, Department of Pharmaceutical Chemistry IMU; Dato’ Dr. Ong Eng Long, President of Institute Kimia Malaysia; Emeritus Professor Tan Sri Datuk Dr. Augustine S.H. Ong, President of Malaysian Oil Scientists' & Technologists' Association (MOSTA) and Associate Professor Dr. Juan Joon Ching, Representative of Royal Society of Chemistry (Local Chapter) during the ‘Future Direction of Chemistry in Malaysia’ forum. Focusing on “Chemistry” this year, the returning annual IMU Science Discovery Challenge provided the students with an exciting opportunity to learn more about science and explore careers in health sciences, in an informal, engaging and stimulating manner. A total of 200 teams of three students each were challenged on their knowledge of Chemistry, in line with this year’s theme, ‘Chemistry Advancing Knowledge, Improving Lives’. “Chemistry is not just a bunch of beakers, test tubes and colourful liquids in a lab. It’s an integral part of our everyday life. Many of the changes we observe in the world around us, the environment, and even in our own bodies, are caused by chemicals. That is why we are actively trying to instil a love and appreciation for science and chemistry through this annual event. We hope that this will in turn foster a greater appreciation and interest in the field of health sciences and encourage more young students to pursue future careers in these fields,” said Professor Peter Pook, Deputy Vice-Chancellor (Academic) of IMU. 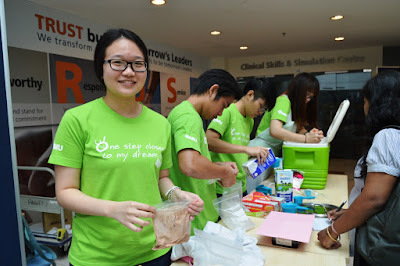 Toh Tzi Shin, 2nd Year Pharmaceutical Chemistry student of School of Pharmacy IMU enjoyed her demonstration of five minutes ice-cream making through science and chemistry at the IMU Science Discovery Challenge: Chemistry Fiesta. “To be part of a chemistry challenge together with other 600 students is super interesting and I really can feel the great teamwork among my peers especially during the workshop segment. I find the overall Chemistry Fiesta is amazing and it really isn’t easy to organize such an event. I have full respect towards IMU for organizing this fiesta,” said Quek Zhiy Hgu, a Form 4 student of SMK BU3. Ahmed Arief Yusof, Form 5 student of SM Teknik Kuala Lumpur getting his hands dirty during the pharmaceutical chemistry demonstration at the IMU Science Discovery Challenge: Chemistry Fiesta. Kuen Cheng High School was crowned Champion in the IMU Science Discovery Challenge, followed by SMJK Hua Lian and 2nd runner up SMK Taman Sea. The top three winning teams of the science challenge received team and school trophies, as well as monetary rewards of RM3,000, RM2,100 and RM1,500 each for Champion, 1st runner up and 2nd runner up respectively. Meanwhile, two consolation prizes of book vouchers worth RM300 were awarded to the 3rd and 4th runners up. 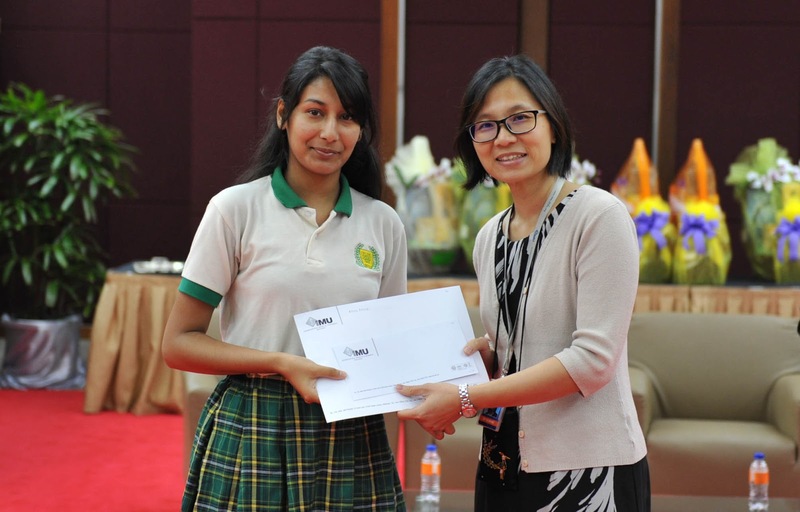 Attika Afroz from MAZ International School receiving the grand prize for the Poster Competition from Dr Er Hui Meng, Advisor of Chemistry Fiesta 2016, IMU. As part of the IMU Science Discovery 2016, the Chemistry Fiesta was held alongside the challenge, in order to educate visitors on how chemistry relates to everyday life and enable them to discover the many career opportunities in the field. 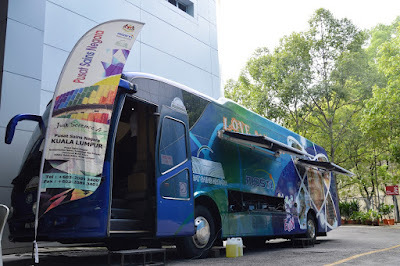 The ‘Love Science’ bus by Pusat Sains Negara is one of the cool exhibits at the IMU Science Discovery – Chemistry Fiesta. Visitors eagerly explored the various activities organised throughout the day, including meeting with industry experts, watching a documentary screening, and participating in the many interactive workshops. 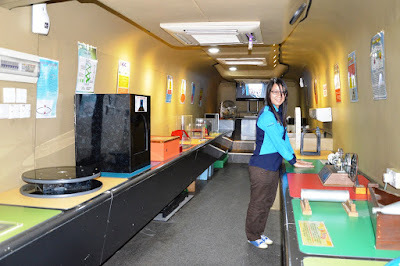 Ms. Lim Li Tian, Science Communicator of Pusat Sains Negara said that the ‘Love Science’ bus has been around for 10 years exhibiting 21 science materials for students and the public. Students also had the unique opportunity to “get their hands dirty” in activities such as making juice-filled caviar and creams, making home-made sanitiser, toothpaste and deodorant, as well as trying to separate dyes in food and cosmetics. “It is so much fun when I can personally do the hands-on activities myself. Now I understand and know most of the concepts. I feel more advanced than my fellow peers who did not come to this Chemistry Fiesta and can definitely apply it into my daily life as I can now prepare my own home toiletries,” said Mohd Firdhaus Bin Mohd Kamal, a Form 5 student of SMK Tinggi Klang. One of the highlights of the event was the Poster Competition, which saw 58 participants put their understanding of chemistry and creative skills to the test. The winning poster with the theme “Chemistry Advancing Knowledge, Improving Lives” by Attika Afroz from MAZ International School walked away with RM350 while the second prize winner, Keenen Khy Vern Ravindran from Regent International School and third prize winner, Cheng Jia Teck from SMJK Confucian took home RM200 and RM100 respectively. “The awareness of chemistry and basic sciences in Malaysia is not that strong. So it is time for us to revive the awareness and let the students be exposed to more of these fundamental sciences. Hence, IMU did it right by organizing the Science Discovery event. It is one of the best ways to let students to explore more. I brought my best chemistry students here so that they can discover science and apply it not just to their school syllabus but also to their daily lives” said Mr. Bong Shiaw Kong, Chemistry Teacher of Woodlands International School, Sarawak.